Every summer I go on a major taco kick. Certain foods are like that for me. I make them over and over with different proteins and flavor combinations in the search for something that is better than, or at least as good as, the best I’ve ever tasted. These are probably my third or forth different taco iteration (the last were Korean Barbecue-style!) this summer and they are damn good. Inspired by fish tacos I had on the beach in Nicaragua years ago, there is a combination of creamy avocado, crunchy slaw, and crispy fish that is really to die for. You might be wondering why I fry the fish. In Nicaragua, the fish was grilled, and I’d likely grill it too if I’d just pulled it out of the ocean, but when working with previously frozen fish (most fish in a supermarket), the frying helps boost and lock in flavor. The danger, as is always a danger with fish, is overcooking. It is much better, I think, to eat slightly underdone fish than fish that has been cooked until dry and flakey. Counterintuitively, frying will help mediate this. Because of the batter, you can’t see the fish, but think of the batter as a cozy blanket it is wrapped up in. That blanket insulates the fish from the worst of the heat and gives you a little more time to get it nice and golden before having to worry about overcooking. I balance out the beer battered fish with a whole lot of citrus. The real key to keeping the dish in sync though, is not doing anything too fancy. The fish is fresh, simply seasoned, and has only a thin crust. The slaw, a bagged mix that makes these tacos oh so easy, is crisp and clean. The lime crema and the avocado slaw work together to bring it all together in one crunchy, crisp, smooth, and delicious bite. Combine 1 cup flour with 1 1/4 cups beer in a bowl. Stir with a fork until smooth. Set aside. Mash avocados in a bowl. Add 1-2 tbsp sour cream and the juice of 1/2 of a lime. Season with salt. Set aside. Combine remaining sour cream and the zest and juice from 1 1/2 limes (using the other half from step 2) in a small bowl. Stir till well mixed. Set aside. Note: Add additional lime if you prefer a stronger flavor. Whisk together juice from 1 lime, 1 tsp canola oil. Add salt and pepper to taste. Toss in a bowl with 2 cups of broccoli slaw. Set aside. Cut cod into 1/2″ wide pieces. Combine remaining 1/2 cup flour with salt and pepper to taste. Heat canola oil, about 1/3″-1/2″ deep, in a frying pan. Dip fish in flour, then in batter, and then gently place into frying pan. The oil should bubble when it goes in, otherwise it isn’t hot enough! Note: I suggest doing a test piece before putting more in so that you can correct for seasoning, oil temp, and cook time! Once fish is a golden color on all sides, transfer to a paper towel-lined plate. Repeat until all fish is cooked and crispy! Warm tortillas in a dry skillet. Assemble tacos! I recommend starting with a smear of avocado, following up with a forkful of slaw, top with a hunk or two of fish, and drizzle on some of the lime crema. 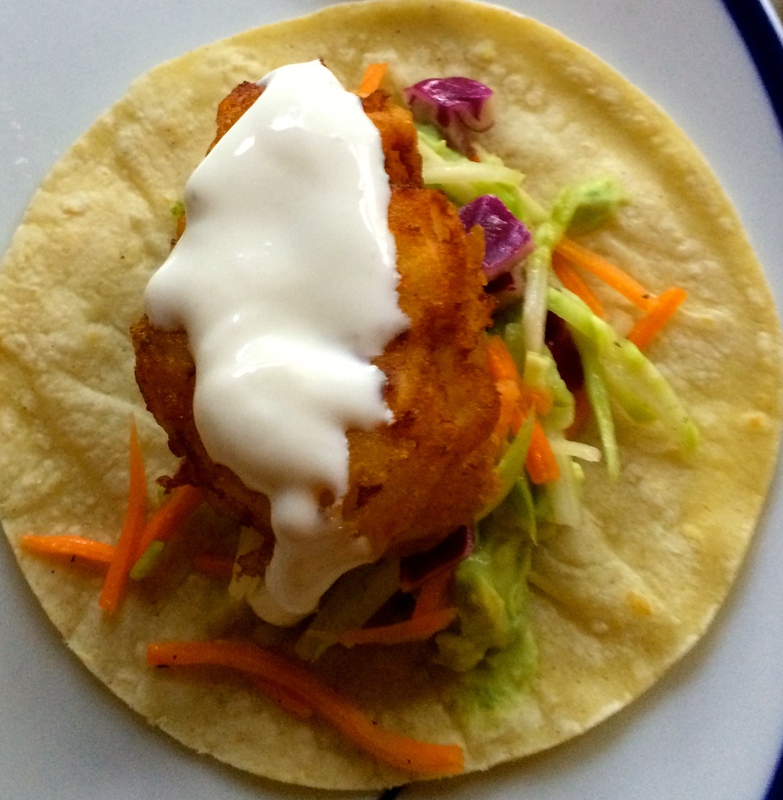 Baja style fish tacos are one of my favorite things. Nice recipe and great tips, esp.about the oil temp. I haven’t tried like cream yet, but will definitely try it next time I make them. Here’s a sauce you might consider – it’s a Peruvian thing called salsa room or sometimes golf sauce. Half a C homemade mayo, 2-3 T ketchup (yes, ketchup) about 1/4 C Orange juice, and a T or two of aji amarillo or similar. Blend until smooth, it’s pretty darned good. Thx for the recipe!